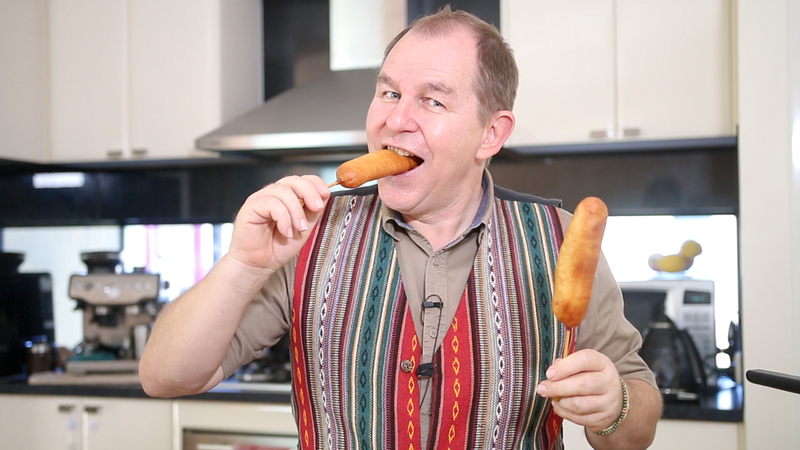 Time for the All American Fairground Food – The Corn Dog. First you will want to make your batter by placing the flour, salt, sugar and baking powder into a bowl. Crack the egg onto the flour and add the milk. Whisk together to form a nice stiff batter that clings to the whisk but just starts to drop off. Set the batter aside for 20-30 minutes to allow the flour to bloom. Turn on the deep fat fryer so it can get up to temperature. Next push the skewers up the full length of the hot dog trying to keep it as central as possible and once you have all your hot dogs onto skewers you can start to dip them into the batter. 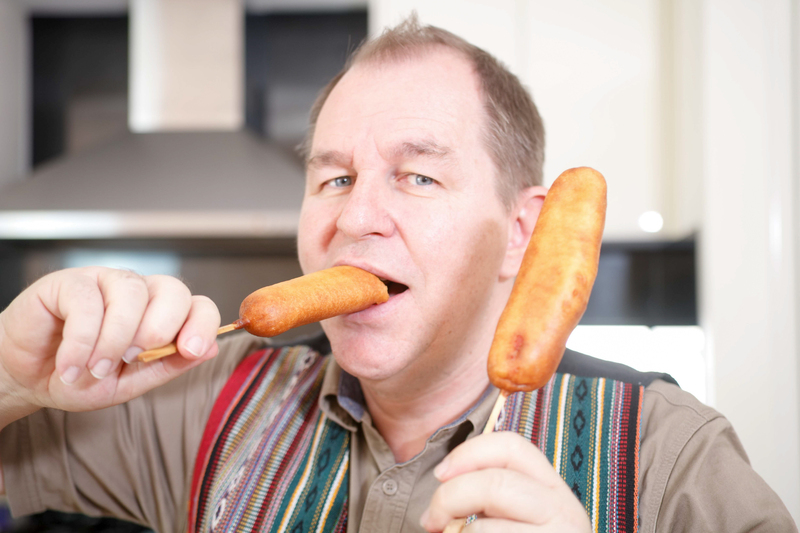 I use a dessert spoon and spoon the batter over the dogs, turning so I get a completely covered corn dog. Give the corn dog a little shake once it is completely covered to allow the batter to even out and then gently place into the hot fat. Lower the corn dog slowly into the fat allow the batter to start to cook before you completely let it drop into the fryer. Allow to cook for 3 minutes or until golden brown. The corn dogs generally turn themselves in the fryer but you may have to give them a little nudge. Once they are cooked remove them from the fat and place onto a kitchen paper on a plate to drain.